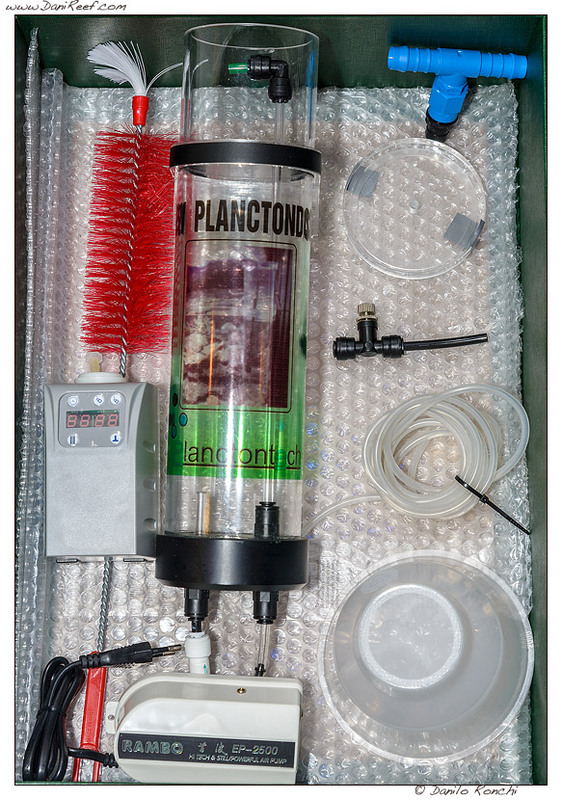 The New Planctondose from Planctontech is a zooplankton dosing station for marine aquarium, designed for benthic organisms, but also all the different types of corals and fishes that can be hosted in aquarium. Testing such an object like the New Planctondose of Planctontech is not a simple affair. 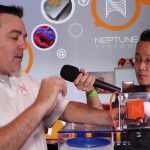 Beyond the technical aspects of our review, one of the key points is the actual need to feed live zooplankton in the marine aquarium. 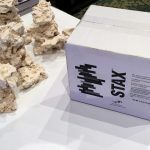 Roberto Ferri, owner of Planctontech and lover of life in the aquarium, said for years that live feeding in the aquarium is absolutely necessary. This position is also supported by Ronald Shimek, Eric Bornemann and almost all aquarists of international renown. 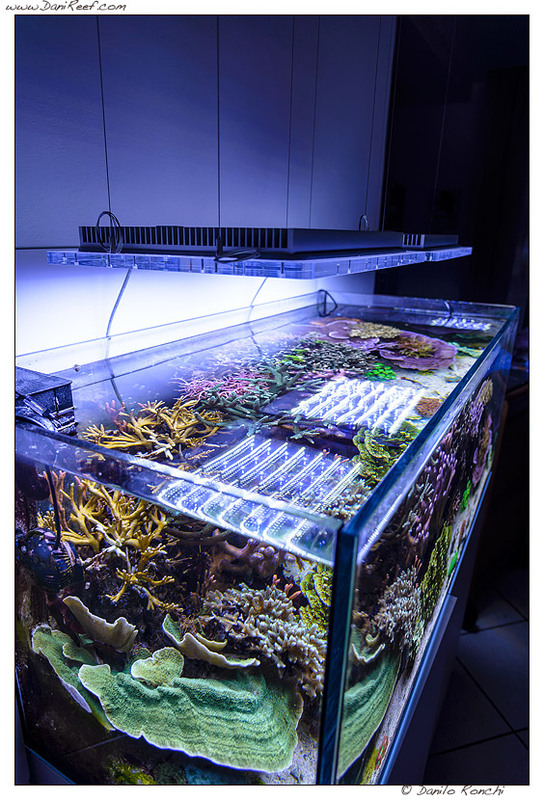 Ronald Shimek, marine zoologist, has conducted several experiments that have shown that to keep an average 300 liters aquarium populated by corals with same planktonic levels as found in nature, we should provide about 270 grams of wet feed per day, such quantity would put our system in great trouble. From this it follows directly that our corals are strongly underfed from the heterotrophic point of view. 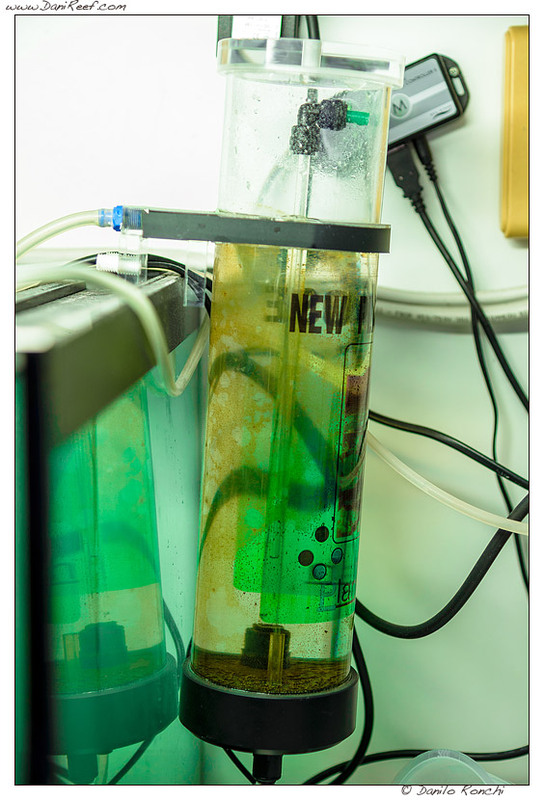 From my personal point of view I believe that the direct feeding with live food, zooplankton in this case, is the best we can dosed in the aquarium, and the New Planctondose is an excellent reactor that allows us to do that with not too much intervention from on our part. But we will develop this and other topics in the following text. The package is the most comprehensive one might expect. 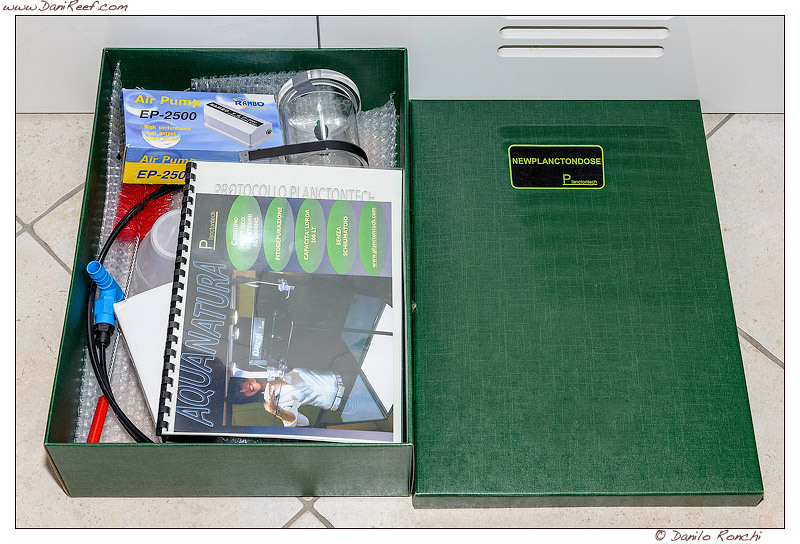 The outer casing of the classic company green, brings it inside a large number of useful accessories. There is of course the reactor, the dosing pump, the aerator, all the pipes we’re going to use, a fine mesh strainer to retain zooplankton, one cleaning brush and a manual about the use of New Planctondose. 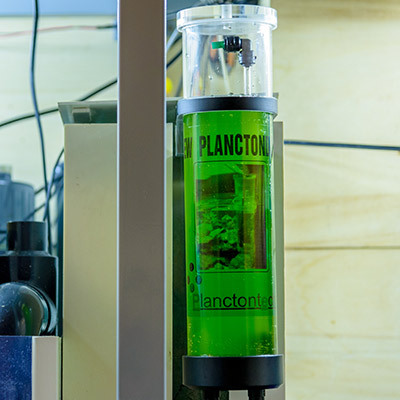 The reactor of zooplankton, or the New Planctondose is constructed entirely of acrylic and has a diameter of 8 cm and a total height of 35 cm. The glass is approximately 12 cm high while the main body about 24 cm. This brings us to a capacity of approximately 1200ml. Needless to say, the construction is virtually perfect. The recommended Zooplankton to use within the New Planctondose is composed by rotifers of the Brachionus plicatilis species, practically the only rotifer marketed in great numbers, often used for weaning of fish larvae in aquaculture. Uploaded by Planctontech Acquacoltura on 2013-06-29. 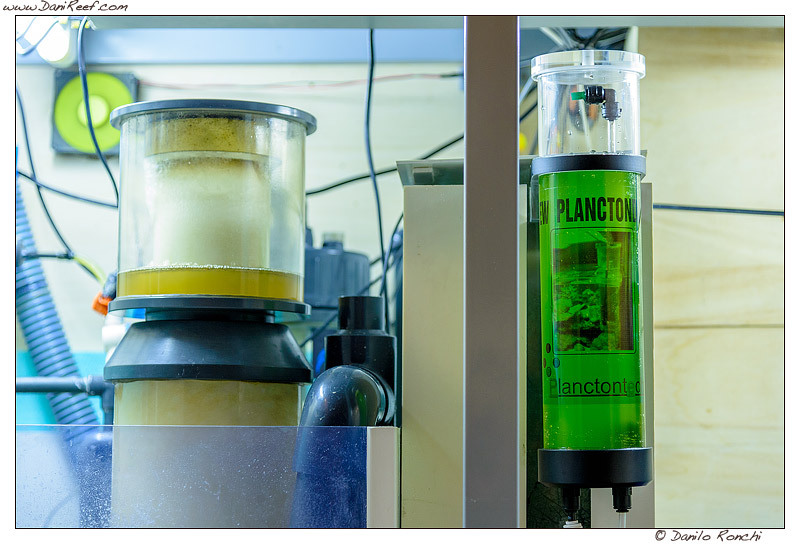 Buying the New Planctondose in store or online you get the single machine without the colture of rotifers needed to make it works. In Italy, however, the colony starter is sold with the machine but sent home directly from the manufacturer, as the starter colony can live for only a few days outside of its environment. So it is quite normal to buy the New Planctondose and behold delivered at home after a few days the colony to start the colture. Outside Italy you have to find the rotifers by your own. The starter colony is nothing more than water at the right salinity for the aquarium, which is 35 per thousand, with live rotifers newly hatched, mixed with phytoplankton, from which the characteristic green color, which will serve as the source for the same rotifers when adults. The reactor has to be connected to aerator, which serves to bring the air, and thus oxygen to the colture, and the dosing pump that, in a second time will bring the aquarium water inside the reactor, and then allow reactor overflow in the aquarium. This, at least, up to the definition of the new administration protocol that instead it advises not to draw any water from the aquarium but from a second container, and which will be detailed later in the article. Each pipe connected to reactor is equipped with a non-return valve and the pipe that connects the aerator is equipped with a flow regulator in order to let pass about an air bubble every second. Increasing the number of bubbles could lead to the breakup of the exoskeleton of rotifers, then I suggest you to follow provided instructions. 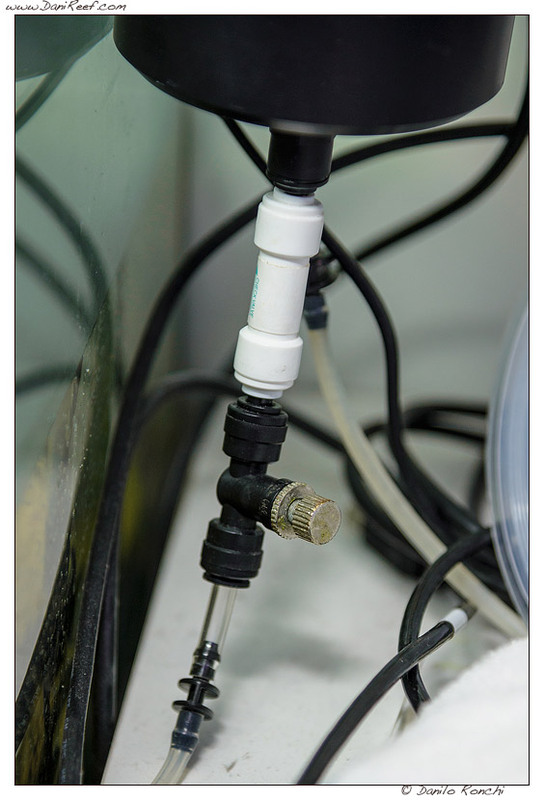 When fully operational, the dosing pump will push a few milliliters of water in the reactor per hour, depending on the settings of the dosing pump, the water will drip from the reactor, and thus will increase the internal level that will flow into the sump, or in aquarium, depending by the choice of placement of the New Planctondose. 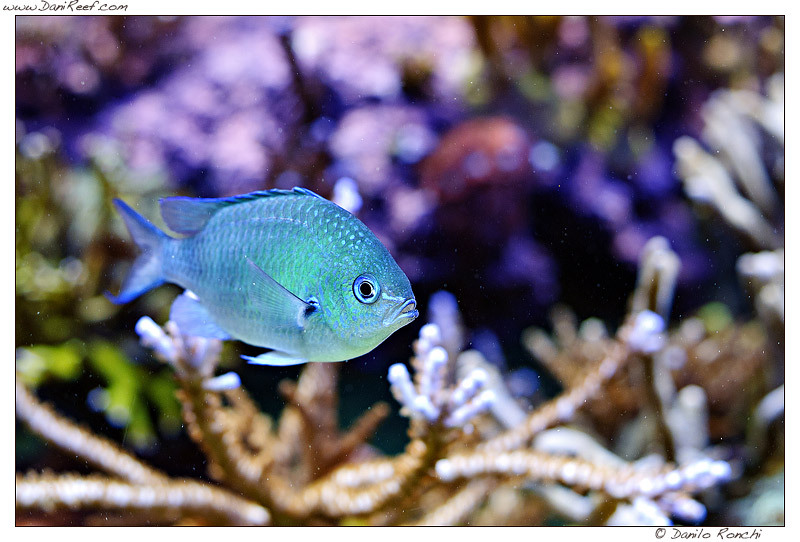 According to consumption of your marine aquarium will be necessary to integrate phytoplankton inside the reactor every one, two or three days. Installation of New Planctondose is extremely simple, and the supplied manual helps us to understand how best to do. The main cylinder of the reactor could be placed on a aquarium glass, or sump glass, thanks to the grooves present and is then properly secured thanks to the two plastic screws. In the bottom we have to connect the aerator. In the picture we can see the connections through john guest connectors and the fine adjustment valve. In this way, the plastic pipes supplied can be put on and remove easily and effortlessly. 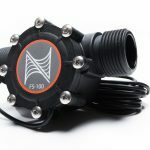 To avoid problems it is advisable that the aerator should be mounted in a higher position respect to the reactor, so that there is never an outflow of water from the cylinder to the aerator, although there is a non-return valve. Next to the air pipe must be mounted the the tube of water recirculation. In the first days of use, until the content in the reactor will not have reached the characteristic amber color, the dosing pump can be installed but not put into operation to avoid to dilute the colture. In practice, we put the plastic pipe that carries the water from the aquarium to the pump, and from here to the reactor, and we connect it in order to release the drops of water, taken from the aquarium (or sump), right to the top of the reactor column. Once the content is turned to the classic amber color you can begin to dose 5ml per hour, up to approximately 10 ml per hour after several days of use, as we shall see later. Also here is absolutely recommended to mount the dosing pump higher than the reactor itself. You also need to pay attention to the prevalence, I had to first load all pipes with pump down, then I proceeded to connect it to the reactor once the circuit was full of water. At this point the installation is complete and the reactor ready to operate, just fill it with the solution provided, composed by rotifers and phytoplankton, and wait for the rotifers, Brachionus plicatilis, reproduce and feed themselves by phytoplankton, making the solution turn from green coloration to amber. To help them, and to increase the density of the colture, the phytoplankton can be dosed up to 50ml per day, so as to leave more food available to rotifers. To understand the density of the colture, after turning off any lights in the sump, you can use a torch that points inside the reactor so that we can put on the other side and see the contents. As we have already mentioned in the introduction, the dosage of rotifers in the aquarium is not simple, and it is not easy managing the correct dosage, because, in fact, there is no proper dosage, but it is necessary to calibrate directly to your own aquarium. To understand the benefits and to understand how to best dose rotifers we took a year’s time, and we have experienced on three high-level marine aquariums. 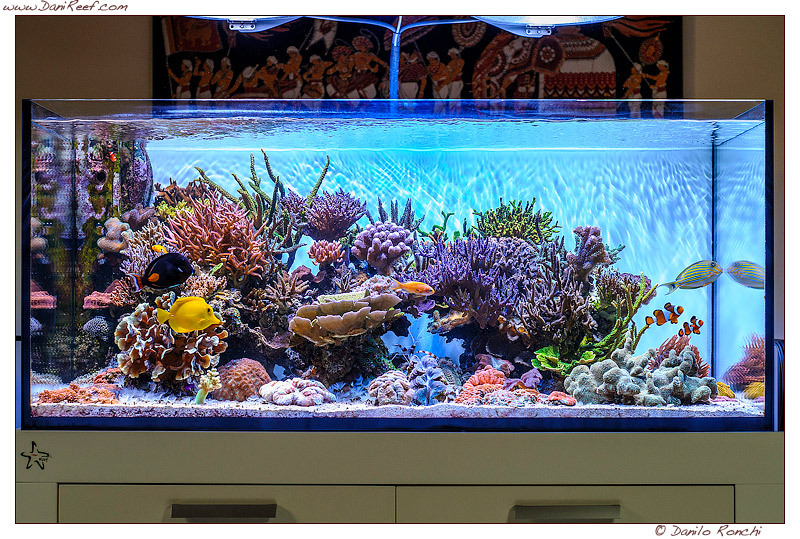 First, as we wrote at the preview of the New Planctondose we put everything in the wonderful marine aquarium by Andrea Negusanti (admires his marine aquarium clicking here). A few months later we tried other settings in the aquarium of Joseph, which we hope shortly to be able to show on these pages. Then again experience a lot inside DaniReef‘s Aquarium. So let’s start with what we found. In the beginning we have to wait until the water turns to amber color, which symbolizes the fact that the rotifers have increased their population and have eaten all the phytoplankton at their disposal. At this point we begin to dose 50ml of phytoplankton every two days and we start to use the dosing pump to ensure, at the beginning, 5ml per hour. This is roughly equivalent to 120ml per day . At this point we begin to increase the value of the dosing until arriving to a recommended maximum of 40ml per hour, 960ml per day, almost a liter. A huge amount of zooplankton for our aquarium. At this point we have to make the first distinction. We have to choose whether to have more rotifers, and then a higher daily dosage of phytoplankton, lead by a continuous charging, even daily, of the phytoplankton, or to obtain a slower time of recharge, every two to three days, and lesser rotifers ready to put in the aquarium. This adjustment does not depend solely on the amount of phytoplankton fed but also and especially by the state of the aquarium. An aquarium with more organic load succeeds further to support the colture that an aquarium that has nutrients equal to zero, but this is not for the nutrients dissolved but for any organisms that this carries, like ciliates and bacteria for example. It’s absolutely obvious if we’ll dose more phytoplankton, we’ll have more rotifers, and more zooplankton will poured into the aquarium. An important thing to emphasize however is the fact that, especially in aquariums with extremely low nutrients, such as ones of Andrea and Giuseppe, the zooplankton poured in aquarium contributes to lower them still more, and it could bring the aquarium in a kind of stalemate that could be very dangerous. So, if the aquariums in which you want to pour the zooplankton have very low nutrient, my advice is to not put too much zooplankton, but to remain at a dose of 50 ml of phytoplankton every 2-3 days. And at the same time, perhaps, decrease a little the skimming. 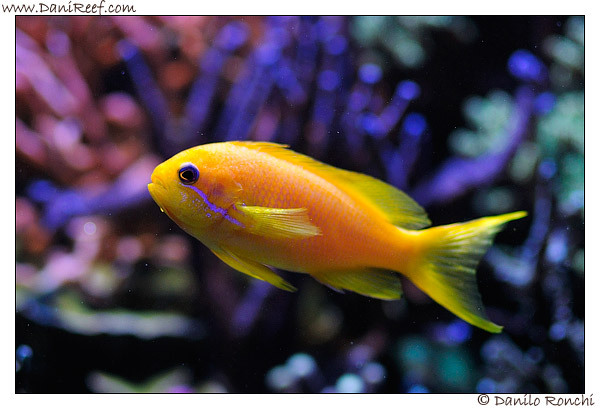 Similarly, if you have not a few fish in the aquarium that you can feed with rotifers, as Pseudanthias rather than Chromis, we can think of a reduced dose of zooplankton, to be sure that there is not an excessive dosage of organisms that can excessively reduce nutrients. An uncontrolled increase of zooplankton, in fact, can be harmful to the aquarium system, because rotifers have a high rate of reproduction, and no animal that could prey them could be a considerable problem. Our advice is to increase the dosage carefully controlling the nutrients and the response of the aquarium, and maybe slightly reduce skimming. While we were rehearsing in our marine aquariums the administration protocol as we have just presented, Planctontech asked us to make a small change to the protocol itself, to get a better efficiency of the whole system . The philosophy major change was to disconnect the input from the aquarium to the reactor. 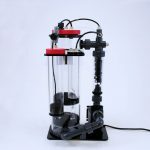 While initially we created a continuous flow aquarium>reactor>aquarium in this second way, we have created a container properly filled where the dosing pump took the water to pour into the reactor. This prevents the contamination of the colture from the organisms living in the aquarium that sometimes, and it has happened to me personally, can clear the colture in a few days. Then you get a colture much more stable and, maybe, stronger. For this you have to insert into the vessel the water with 1016 density, rotifers and phytoplankton. And then the dosing pump, simple and direct. All three saltwater aquariums, more or less, had a feeding protocol, based primarily on amino acids, sugars and zooplankton dry. The transition to the dosing of live zooplankton must be slow and does not have to eliminate all forms of previous feeding system. This is because our corals, before starting the dosing, were not more accustomed to prey, so they have to get used to prey on plankton that live and move. Other than that, it’s better to diversify sources of feeding, in our opinion. Once you start the dosage you immediately notice two things. 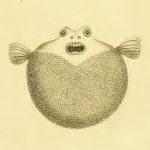 First of all the fish, of course predator species such as Chromis, Pseudanthias, Chrisiptere, and others, will run to eat all the rotifers released into the aquarium, often assuming also poses that can be seen only in nature, such as the school of Chromis that you have in front of the outlet of the pump and moves in unison hunting. In addition to the behavior of fish during the administration you will immediately notice, within a few days, an almost uncontrolled increase of benthic fauna. Amphipods, copepods and all other small organisms that make up the benthic fauna increases in number significantly, and often also of size, with benefit for the entire ecosystem. It’s not so easy to understand if something is happening on our corals. well, our corals have had the polyps everted more than usual, thanks to more zooplankton in the water, but I think it’s almost impossible to measure the effective usefulness of the Planctondose. we have no indicators that say to us that live is better than dead zooplankton, maybe during time, this feeding will lead our corals to grow much more better… but it’s impossible to measure it… here. We’ll settle to register what we have seen and to tell you in a simple and neutral way. All three aquariums have had corals in healty state, they never turned brown, neither they did it when we use much more zooplankton than advised. No loss of corals or bleaching, not even when we have stopped all other feed. In every three aquariums we noted a decrease of nitrogen and phosphorus. To use the New Planctondose by Planctontech it’s not easy how using a pump. You need to maintenance it, you have to dose the Phyto continuously, and every two months you have to take out the filter and to clean it. The rotifers population could be unstable and some time you risk to loose the entire colony without any apparent reason. Other than that, it’s very important to do the right regulation of the reactor. We need to find the right dosing of Phyto inside reactor, and the zooplankton in the aquarium, to avoid the loss of colture in the reactor and to avoid to lower to much the nutrients. It’s very important to observe very well the aquarium, so to do water tests more often than ever. 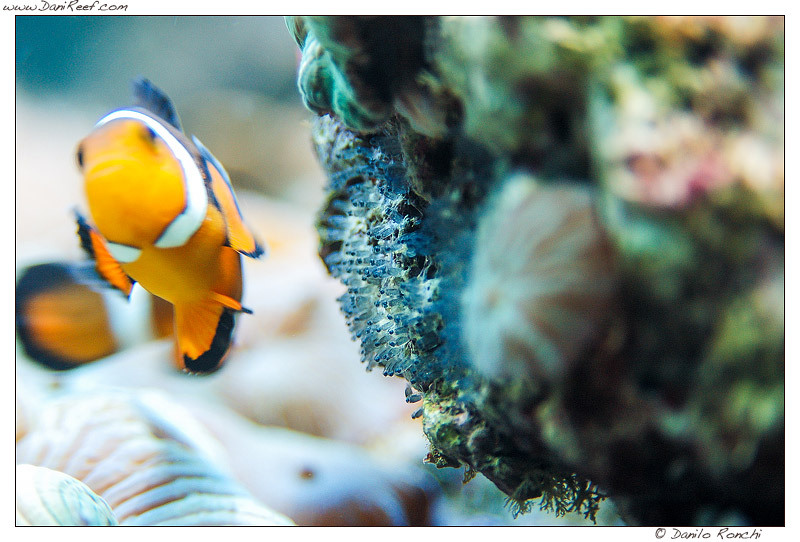 Every three days it’s a good starting point to try to observe all the changing will be in the aquarium. 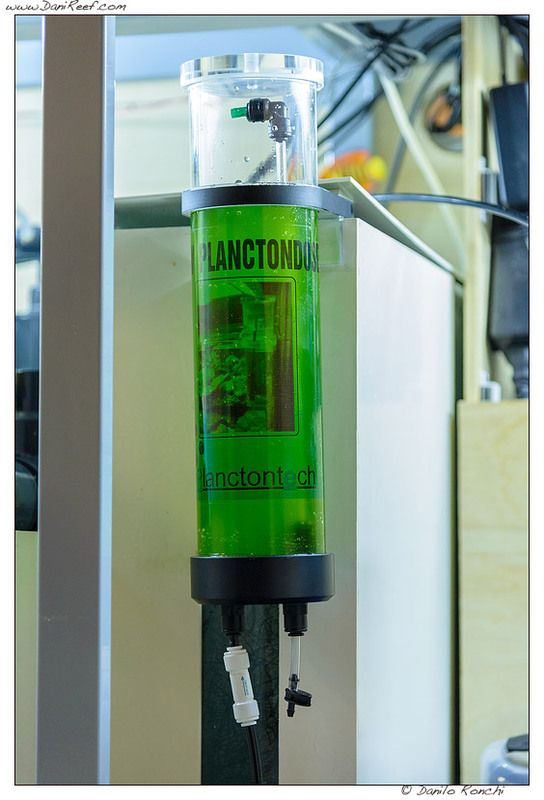 We think that the New Planctondose could act as it was a Refugium, built to feed our corals, in this case by dosing Zooplankton, rotifers of Brachionus plicatilis species, but occupying so little space in sump and with immediate results. 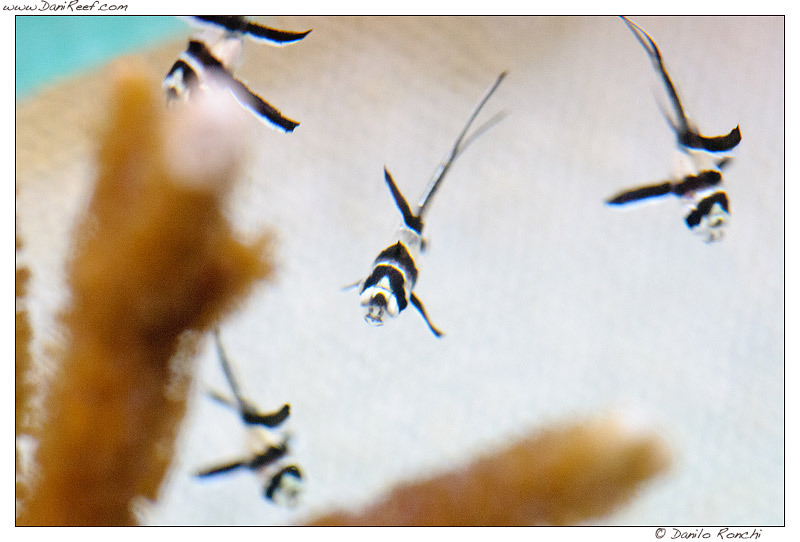 In our opinion to dose Zooplankton is the best thing we can do for our aquarium, not less. We will not worry about fishes with feed problem… by Zooplankton all fishes will eat, and with so many joy… if we can say that about fishes that feed… No problem, for example, with such a species like Pseudanthias squamipinnis that, in so many cases, the aquarium keepers don’t buy them for fear they will starve. Now we all can. In such a cases where we have the luck to have some little baby fish in aquarium, like, for example, Amphiprion ocellaris or Pterapogon kauderni we can feed them with rotifers in a very perfect manner. The benthos will benefit too with a very growth of population that will have positive reaction for all the system. What else? The corals will have more extroflexion of polyps and will show a very good (better?) health. And we have to add that, passing from dried zooplankton to live zooplankton, the aquariums nutrients will decrease, as all our three examples have shown. Using zooplankton can be only a great addition for whichever aquarium, also if we have experienced some trouble in dosing as we have pointed out in this long review. We have to monitor all the nutrients, we have to strictly setting our skimmer. We have, in a few word, to watch to our aquarium. 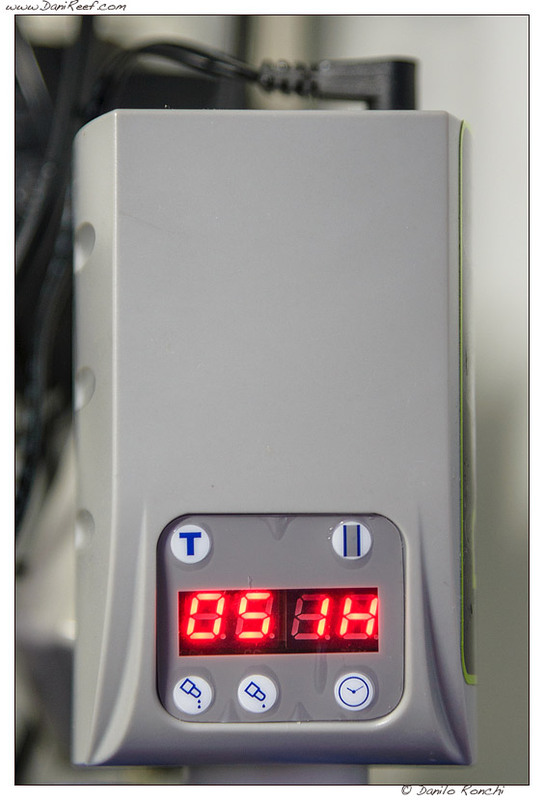 But yes, in truth, we have to do in any case… Many thanks to Planctontech for providing the New Planctondose tested.